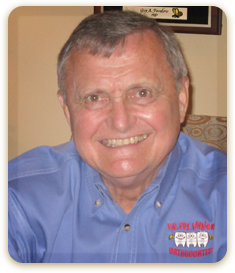 After practicing orthodontics for over 40 years, it has been my pleasure and passion to create beautiful smiles for all of my patients. Watching the change in their personalities as their appearances improve is as exciting to me as it is to them, and I am proud of the quality results that help make their confidence bloom. I retired from active practice in December of 2015. I was born in New Orleans, Louisiana. I went to high school in Houston, Texas, graduating in 1956. It was during my high school years that I became inspired to study dentistry due to an extremely motivating orthodontist who worked on me as a teenager. From high school I went on to the University of Houston where I began pre-dental studies. From 1959 to 1963 I went to Loyola Dental School in New Orleans where I earned my Doctorate of Dental Studies. After graduation, I joined the US Army and was stationed in Honolulu, Hawaii. After 5 years of military service, I left the army and entered private practice in LaPlace, LA. In 1972, I was accepted into the LSU Dental School Orthodontic Department in New Orleans. After graduation, I opened my private practice and also began as a part-time faculty member in the LSU Orthodontic Department. In 2009, I retired from LSU as a Clinical Professor in Orthodontics. I was married my beautiful wife, Jean Holt Favaloro, in 1962 until her death in August of 2014. Together we have three amazing sons and 7 grandchildren. Added to my wonderful family are our two dogs, Gracy and Baxter. I officially retired from active practice in December of 2015. My hobbies include working in the yard and reading.